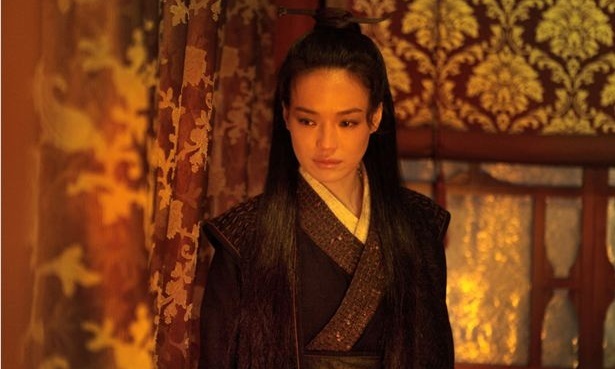 In this once upon a time kingdom, there is one woman (played alternately with beautiful stillness and incisive action by the wonderful Shu Qi), caught in the midst of a large world she cannot control, a world that has named her its assassin and imprinted upon her its own mission, denying her her own world. She dances an assassin’s dance with a swift grace that leaves me breathless, but her sweet, sad face is the print left on the mind and heart. For within the cage, she recognizes someone like herself, but he is not someone she can touch; like a mirror, it is recognition, never communion. One woman, one single bird, she can only submit to the cage, but her song is her own and is for herself and for the one she recognizes. Through a gauzy curtains she gazes, intent and still, until her mirror image startles, seems to see her, and finally, he recognizes her by the jade she carries, a match to his own. In fear and anger, he rushes after her, too caught in the world outside the jade to turn and own the treasure as a kindred. They face one another and dance, exchanging swords. She could kill him if she wishes, but she cannot kill herself, her kind. The power of myth, the power of cinema, so often, is that it sheds light on the little stories that happen within the larger, and those little stories, illuminate the larger, showing the hubris of the great beside the emotive power of an intensely focused single being. The woman’s song, though she may die, transcends the world who owns her, shows us that world’s littleness. The political world controls the prisons, but it does not realize it is, itself, within a world indifferent to those politics, so sublime in beauty and peace, nothing can touch it. A sudden flurry of swords, a swift and terrible slicing knife, these are almost instantly absorbed by a nearly unbearably loveliness: starkly white birches, wind in leaves, a dapple of sunlight, these smoothly erase the ruffle. If you squint at a landscape, lush in color, sweeping in expanse, you might see a little procession of figures on horses, flags glibly fluttering; they seem to think they are about some grand business, but as quickly as you spot them, they disappear, lost as quickly as they are found, in the tall grasses. Only a still lake of water, reflecting a pink sky and guarded by black shadowy figures of trees, remains. Or a single peony stands, seeming to exist only for itself, breathing out a self-content joy. If the slight human figures appear again, a mist swallows them. Or a darkness. Or a towering cliff. In the evening, crickets still chirp on the instruments of themselves; in the morning, birds sing on, unhindered, untroubled. Resting with them, I am apt to forget any king or kingdom’s struggle. In the end, only the woman and her song, the land, the grasses, the sky, the trees remain, powerfully pressed upon the heart. 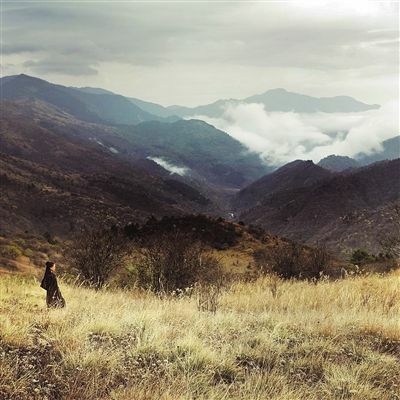 The grace of her song makes her a harmonious part of a gracious landscape, swallowed by it but not forgotten, as those kingdoms surely shall be.